Summer means more market nights in Melbourne. A had come for a visit and I had spent the previous week making lists of places to go, things to see and eat, and refining the said list. Is that too much? I didn't want us to chasing one item after another down the list. On the other hand, hopefully it's not too little and we get bored by the long spaces in between? Nope. Not a chance. It was almost perfect. We still did a lot of walking, but that's kind of given in my kind of city touring. 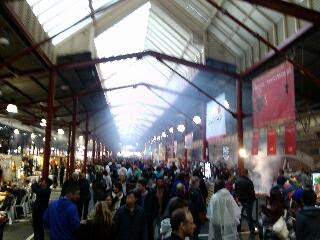 The first item on the list was: Queen Victoria Wednesday Night Market. Every Wednesday during the summer, the normal fresh produce and merchandise markets close up to give way to stalls of mouthwatering foods and live music. Everyone is spoilt for choices. Alligator meat burgers? Spanish paella? Korean potato ringlets? A fell in love with his passionfruit cocktail mix. I loved the foods. Miam miam.